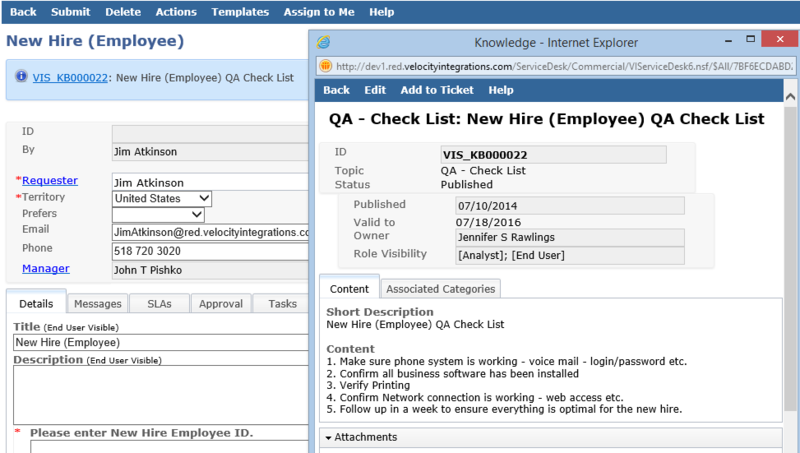 Request Management in the VI Service Desk - VIS, Inc.
End Users can quickly and easily submit a request from the Service Catalog where the majority of the field information on the request has already been pre-populated. Fulfillment time is automatically displayed and Due Date is automatically calculated based on specified hours of operation. 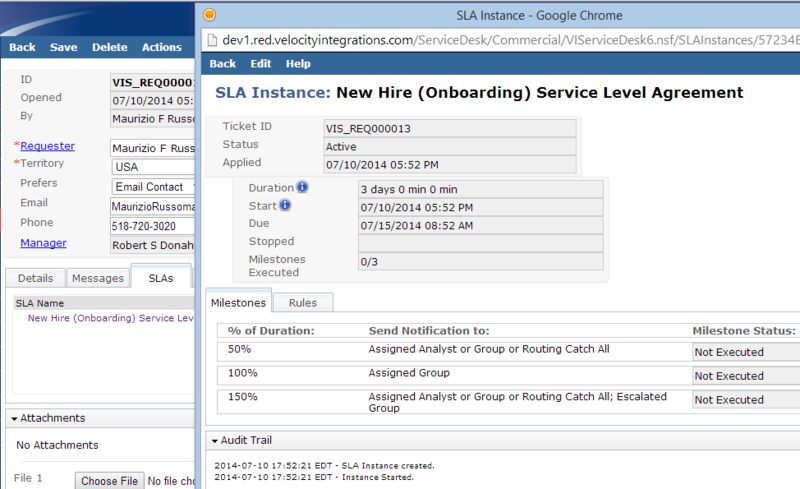 Once a Request has been submitted, the system will automatically apply any SLAs, Approvals, and Task Workflows. Email notifications are sent to all relevant personnel. 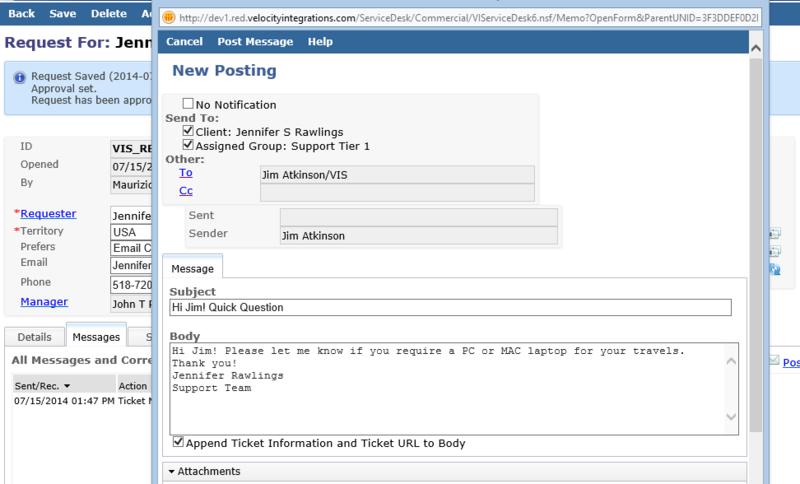 Initiating an email dialogue with any person pertaining to a request is quick and easy via the service request ‘Messages’ tab. For more urgent matters, send an instant message to the person you are trying to reach. The email correspondence within the ‘Messages’ tab is bi-directional, which means all replies/correspondence will be stored within the ‘Messages’ tab. Automatic display of relevant Knowledge documents based on the request category can be very useful in completing a request in a consistent and timely manner. For example, during the New Hire (Employee) process, a QA (Quality Assurance) knowledge document can provide a high level check list to make sure all basic procedures have been completed. Upon submittal of a request the VI Service Desk’s ‘Ticket Router’ will evaluate any Routing Rules in Analyst Profiles and Analyst Group Profiles to identify the best match based on the category and territory/site of the ticket. 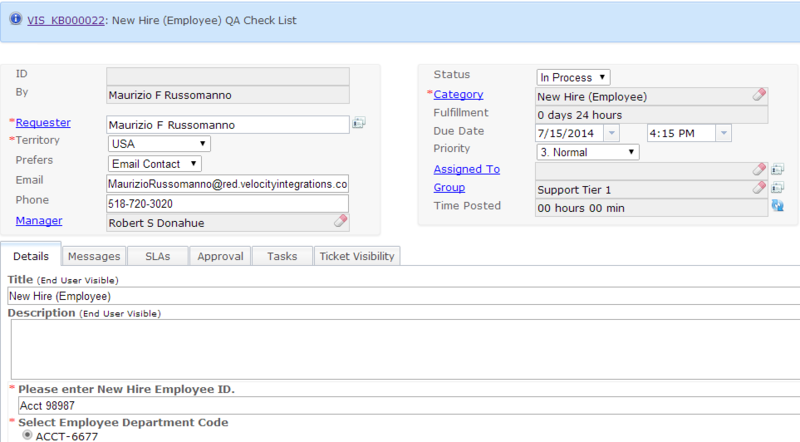 Analysts can easily enter work and time spent within the Work History section of the request form. The ‘Templates’ menu, located at the top of the Request form, enables an analyst to quickly select a template associated with a particular request type. This saves the analyst time by auto-populating related request fields such as Categorization, Priority, Assignment, Title, Description, and Work Performed. When a request has been fulfilled, set the Status field to ‘Completed’ to begin the closure process. A dialog box will be displayed prompting the analyst if he or she would like to add request details to the knowledge base, select a closure category, and include additional notes. Once submitted, the request approval process will begin followed by a survey once the requester has approved/confirmed the completion of the request. Specific details of the closure process can be custom tailored within the System Settings document. See screen example for details. The closure process can be overridden by a user with manager level rights. In this case the Status of the request can be set to ‘Closed’ with no further action required.